The Orumiyeh lake is Iran's second biggest lake, between East Azerbaijan and West Azerbaijan. 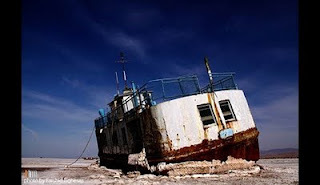 It is the largest lake in the Middle East, and the third largest salt water lake on earth, with a surface area of approximately 5,200 km², but it is drying up as a direct result of government policies. Irregular dam projects, uncontrolled digging of underground wells and building a motorway bridge which has drained parts of the lake has caused 60% of the lake, so far, to dry up and it could disappear entirely, turning it into a salt marsh which will directly effect the climate of the region. Any protests against these government policies, like any other protests in Iran, have been severely dealt with. In April, last year, Special Units were deployed by the regime to beat up peaceful protesters. The Iranian parliament, the Majlis, recently rejected an emergency bill to save the lake and the Friday Prayer leader of Orumiyeh, the notorious Mullah Hassani who shopped his own Marxists son that led to his son's execution, called the protests illegal and against the national interests! Despite all this, the people of Orumiyeh came out in their thousands today and chanted "The lake is on its last breaths and the Majlis issues its death sentence"
The very regime which supported the UK riots and condemned UK police brutality against the rioters responded to the protests by firing plastic bullets and mobilising more troops to Orumiyeh. At the same time there are reports of protests spreading to Tabriz, with clashes reported at Marlan and Taleghani districts of Tabriz. Well so much for so called men of spirit looking after God's or Allah's Earth eh? Good to see Iranian people at least protesting again for what's morally and ethically right! Unlike the chushy job Mullahs! In fact wasn't it THIS recipe of corruption and lack of jobs under a brutal tyranny that started the Arab uprisings in the first place??? Surely if Assad now goes, Khamanei's and Ahmadinejad's knees had better start knocking too..? The trigger of the people's explosion hasn't gone away. If anything it just hangs even more fearfully present like the sword of damocles over the Regime's despicable heads!